Debris scatters a destroyed community in the aftermath of Hurricane Maria in Toa Alta, Puerto Rico. The Senate is pushing ahead on a $36.5 billion hurricane relief package that would give Puerto Rico a much-needed infusion of cash but rejects requests from the powerful Texas and Florida congressional delegations for additional money to rebuild after hurricanes Harvey and Irma. The measure is sure to sail through a Monday, Oct. 23, procedural vote and a final vote is expected no later than Tuesday. WASHINGTON (AP) — The Senate on Monday gave a preliminary OK to a $36.5 billion hurricane relief package that would provide Puerto Rico with a much-needed infusion of cash and keep the federal flood insurance program from running out of money to pay claims. The 79-16 procedural vote set the stage for a final vote, most likely on Tuesday. The measure also provides $18.7 billion to replenish the Federal Emergency Management Agency's rapidly dwindling emergency disaster accounts. On Monday, FEMA announced more than $500 million in aid to Puerto Rico, including $285 million to help restore power and water services to the devastated island. An additional $16 billion would permit the financially troubled federal flood insurance program to pay an influx of Harvey-related claims. But the bill rejects requests from the powerful Texas and Florida congressional delegations for additional money to rebuild after hurricanes Harvey and Irma. Florida Democrat Bill Nelson, whose state's citrus industry endured significant losses during Irma, sought to add $3 billion in immediate agriculture assistance to the measure, but was denied by Majority Leader Mitch McConnell, R-Ky., who said money for crop losses would be in subsequent aid measures. Senate passage on Tuesday would send the measure to President Donald Trump for his signature. There was urgency to move the measure swiftly — rather than add more money to it at this time — because the government's disaster response and flood insurance reserves are running out. Democrat Sen. Patrick Leahy of Vermont said that would happen "in a matter of days" without action. Still, members of the Texas and Florida delegations in Congress are unhappy because the measure failed to address extensive requests for additional hurricane rebuilding money. Texas, inundated by Harvey in August, requested $19 billion, while Florida sought $27 billion. "I'm pretty disappointed with what the House sent over," Texas GOP Sen. John Cornyn said last week. But later, after speaking to both Trump and White House budget director Mick Mulvaney, Cornyn said he was promised that the White House would issue another disaster aid measure next month for Texas, Florida, and Puerto Rico. A fourth, and perhaps final, measure is likely to anchor a year-end spending bill. "The victims of these hurricanes can continue to count on our support," said McConnell said. Up to $5 billion of the measure's total could be used to assist Puerto Rico's central government and various municipalities that are suffering unsustainable cash shortfalls as Maria has choked off revenues and strained resources. An additional $150 million would help Puerto Rico with the 10 percent match required for FEMA disaster relief. More than one-fourth of the island's residents don't have potable running water and only 17 percent have electricity, according to FEMA. Just 392 miles of Puerto Rico's 5,073 miles of roads are open. 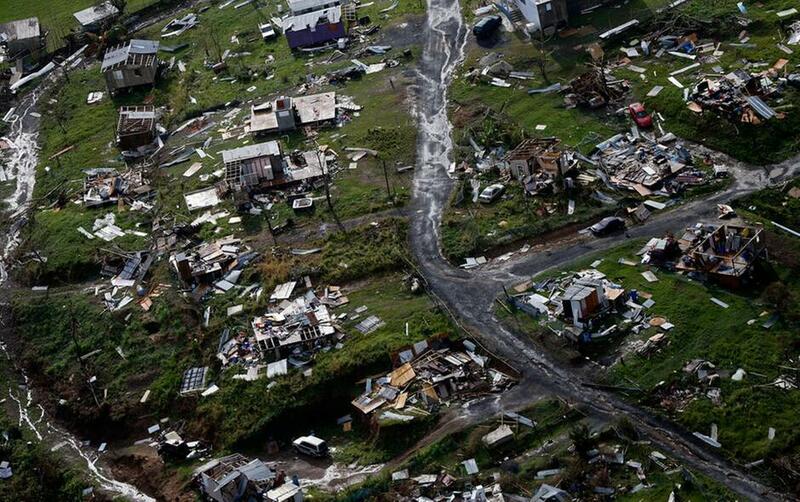 Conditions in the U.S. Virgin Islands are bad as well, with widespread power outages. But Trump last week graded his response to the Puerto Rico disaster a 10 on a scale of 10. "President Trump seems more concerned about claiming credit for a job well done than the actual situation on the ground deserves, particularly in Puerto Rico," Leahy said. "This is the hard part of governing," he added. "We dig in for the long haul, we stop patting ourselves on the back." The measure currently before the Senate contains $577 million for wildfires in the West that forced agencies to tap other reserves for firefighting accounts and FEMA money. Republicans delayed action last year on modest requests by President Barack Obama to combat the Zika virus and help Flint, Michigan, repair its lead-tainted water system. But they are moving quickly to take care of this year's alarming series of disasters, quickly passing a $15.3 billion relief measure last month and signaling that another installment is coming next month. Damage is still being assessed and final cost estimates for recovering and rebuilding from this year's hurricane season are not in yet. Some House conservatives are becoming restive at the high price tag for the disasters, which come as the deficit is growing.